Q: Who should take PRIME Age Defense Formula? A: Prime™Age Defense Formula is highly recommended for vegetarians, smokers, anyone who eats rich processed foods, sweets, alcohol, or grilled, broiled and fried foods. This lifestyle contributes to glycation, which causes sugars to bond with protein, resulting in the formation of advanced glycation end products (AGEs). AGEs works just as the name implies, ages the body. PRIME Age Defense formula helps support the body’s normal ability to remove AGEs. Q: Is Isotonix Essentials Turn Down okay for children? A: Turn Down is not formulated for children. Recent studies show a relationship between vitamin D deficiency and sleep disturbances. A multivitamin, well-balanced diet and a healthy amount of physical activity should contribute to normal sleep patterns in children. Q: Are the Daily Essentials Packets still effective even once they’ve stopped fizzing? A: Yes, the fizzing of the product does not affect how your body absorbs the product. Q: What is Bioperine® and why do you include it in Isotonix Maximum ORAC Formula? A: Bioperine®, a black pepper extract, aids the bioavailability of many nutrients, such as antioxidants. It promotes their absorption into the cells lining of the small intestine. Q: Why is there sugar in Isotonix products? A: The amount of sugar in our Isotonix is 2 grams of low glycemic index fructose. You might find this amount in one small bite of a sweet fruit. Since glucose is aids in the absorption of nutrients, certain amounts of sugar are used to enable the rapid delivery of key nutrients. Our products become isotonic when mixed with the proper amount of water. Taken on an empty stomach they deliver 97% of nutrients to the small bowel within 5-15 minutes. The isotonic state is the same as tears and blood, so the nutrients are in the bloodstream within 5-15 minutes. Our products do not contain binders, fillers, animal gelatin or coloring agents found in many other pills, hard capsules and soft gels on the market. With our Isotonix products, the body does not have to work to break down pills and capsules, nor are our products wasted due to non-absorption. Q: How do I know which Isotonix products would be best for me or which ones I should be taking? A: Shop.com has an online tool, the Nutriphysical, to help you select the exact nutrient supplements your individual body requires. It is completely customizable for your selections. You can take the Nutriphysical here! 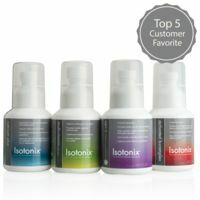 You can also design your regimen by how much of each nutrient you desire by following this link on the Isotonix site. Q: Why is it recommended that I take Isotonix Isochrome with food? A: Isotonix Isochrome should be taken with food because it contains the fat-soluble coenzyme, CoQ10. This means it dissolves in fat or oil, so it is more effective when taken with a meal.